Tetralogy of Fallot is a congenital heart defect which consists of 4 components: the aorta overriding both ventricles of the heart, a hole between both ventricles, narrowing of the right ventricle outlet and thickening of the right ventricle muscle. This leads to blue baby as the blue non-oxygenated blood is shunted from the right heart to the left without passing through the lung. The definitive treatment is total surgical correction which can be performed safely during the early months of life. Babies with low birth weight or unfavorable anatomy are considered high risk and can have staged operations. Fig. 1. Changes in the right ventricular outflow pressure in patients with preserved pulmonary annulus compared to the patients with pulmonary patch. The complete surgical repair of the defect usually involves division of the right ventricular muscle to remove the obstructing bundles in the outlet of the right ventricle; in addition, the pulmonary valve can be excised or replaced by a synthetic material which doesn’t grow with the child. These maneuvers have drawbacks on the heart function later in life. The incision of the right ventricle leads to weakening of the heart muscle and consequently right ventricular failure. Excision or replacement of the pulmonary valve and dilatation of the pulmonary artery lead to leakage of the blood back into the right ventricle and its progressive dilatation which leads to late heart failure. All these consequences increase the probability of poor quality of life and even death for those children. Several techniques have been proposed to alleviate the acute and chronic right ventricular volume overload after tetralogy of Fallot repair and recently pulmonary valve sparing procedure has gained popularity. Pulmonary valve sparing could play a role in decreasing the regurgitant volume to the right ventricle and the native pulmonary valve has the advantage of growth potential; therefore, babies may not require future operation to repair or replace the valve. However, it may lead to residual pulmonary valve narrowing and consequently increasing the right ventricular pressure especially when performed in patients with moderate and severe narrowing of the pulmonary valve annulus. 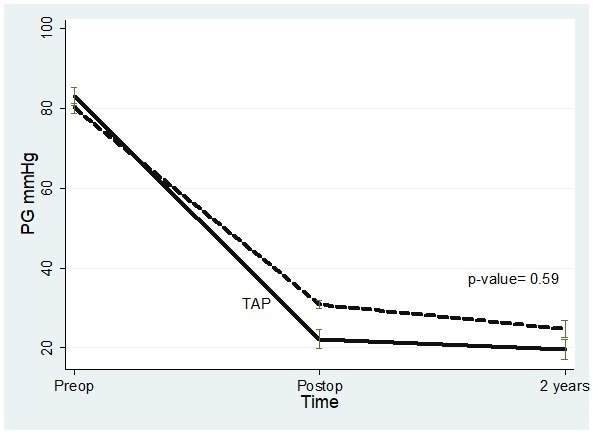 The effect of pulmonary valve sparing on valve competency and valve reoperation rate needs further evaluation especially over long follow ups. This study was performed to evaluate the effects of pulmonary leaflet and right ventricular preservation combined with tricuspid valve repair on right ventricular outflow tract pressure gradient, degree of pulmonary valve leak and reoperation in babies undergoing repair of tetralogy of Fallot. The right ventricular muscle was preserved by performing the operation through the right atrium and the tricuspid valve “which is the valve between the two chambers of the right heart” was evaluated for the presence of any degree of leakage which was repaired prevent volume overload on the right heart. Pulmonary valve preservation was feasible in all babies. Repair was successfully performed through opening of the fused valve leaflets by a knife in most babies and few required more complex valve repair. The technique was effective to relieve the obstruction in all babies and hospital complications were comparable to the standard operations. During follow-up, the pressure gradient at the outflow of the right ventricular continued to decrease “indicating no narrowing” (Fig. 1) and the degree of the pulmonary valve leak did not increase. 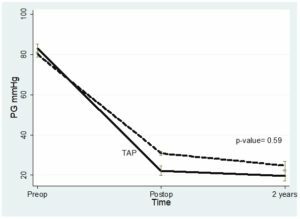 In babies who required late re-intervention, 2.5% of them were due to narrowing of the right ventricular outlet. This study proves that preserving the pulmonary valve and the right ventricle during repair of tetralogy of Fallot combined with aggressive management of any tricuspid leakage are safe and effective in managing the narrowing of the right ventricular outflow tract. Surgical strategies protecting against right ventricular dilatation following tetralogy of Fallot repair.